For nearly two centuries, scholars have wondered how on earth Mary Shelley, a nineteen-year-old girl, was able to conjure one of the most frightening and enduring horror stories of all-time: Frankenstein. But with the recent discovery of Mary Shelley's secret memoir, the truth is finally revealed: Mary Shelley didn't just write Frankenstein, she lived it. Traveling back to that historic Geneva winter of 1816, Mary, her fiancé Percy, sisters Claire and Fanny, and the celebrated poet Lord Byron, find themselves guests of the eerie Frankenstein Estate. The macabre and frightening events that follow lead Mary to both a gruesome and shocking discovery. Their mysterious host is not at all what they expected, and their intentions will change the course of Mary's life for-ever. 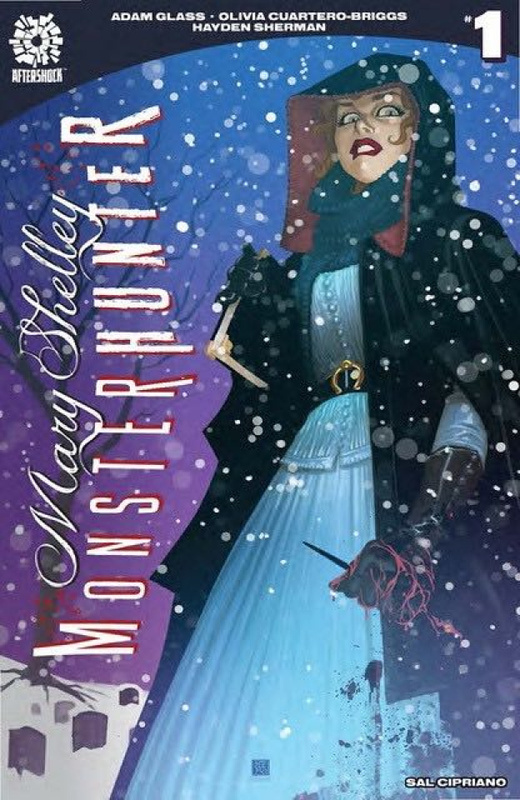 Brought to life by Adam Glass (ROUGH RIDERS, THE NORMALS, THE LOLLIPOP KIDS) and Olivia Cuartero-Briggs (E TV's The Arrangement) with art by Hayden Sherman (COLD WAR, The Few, Wasted Space), Mary Shelley: Monster Hunter is historical fiction at its most (After)shocking!